Today we interviewed Representative Earl Blumenauer of Oregon’s 3rd Congressional District. 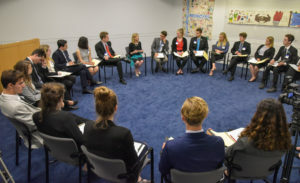 The interview was conducted in the Cannon House Office Building, a massive, five-story-tall marble structure containing many congressional offices and even more stairs. 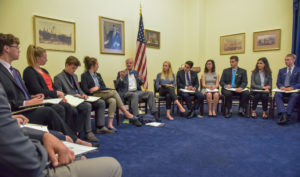 Since I will be a constituent of Representative Blumenauer when I go to Reed College next fall, I volunteered to be a part of the group that researched and wrote questions for the interview. As with all other interviews I’ve participated in, the time leading up to the question I had been assigned was somewhat tense as I continuously repeated the question in my head in an effort to perfectly memorize each word. Before long, it was my turn to speak (a moment which came as a bit of a surprise due to a last minute rearrangement of questions). Fighting my anxiety, I tried my best to speak slowly and articulately. My question was specifically concerned with political biases and how we can overcome them to be more receptive to new ideas. After I asked it, there was a brief and terrifying silence, which was broken with Blumenauer saying that it was a difficult question. He proceeded to talk about the differences between humans in terms of who we are and the things we experience over the course of our lives, and how these differences can cause emotional biases. Much of what he talked about reminded me of a book by Jonathan Haidt called The Righteous Mind, which we read this year as part of our Values curriculum. Overall, I definitely enjoyed the interview. Blumenauer spoke very eloquently. He provided a lot of insight into many relevant issues, and it was abundantly clear that he not only knew a lot about them, but also was very passionate about resolving them. 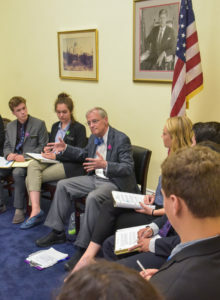 I found Earl Blumenauer to be one of the most interesting and engaging people we have interviewed so far, and, if given the chance, I would strongly consider voting for him. 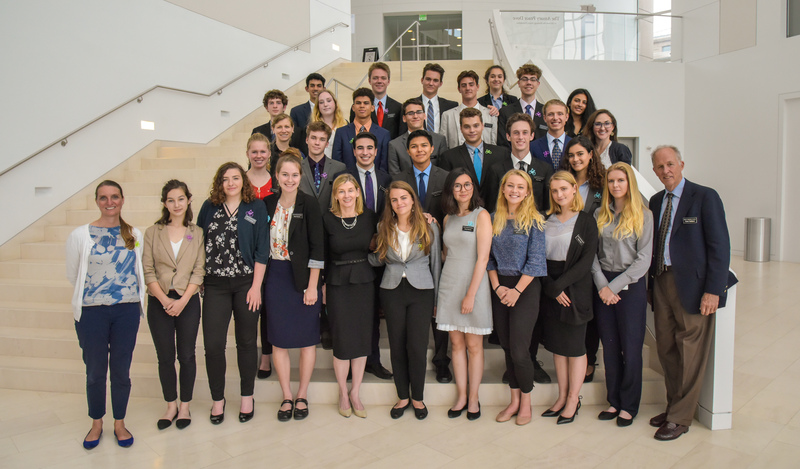 In addition to the exposure to numerous ideas, the interviews of this trip have offered an interesting insight into the personality and characteristics of our representatives. Today we interviewed Congressman Blumenauer. The moment he entered the room you could tell that his way of thinking was different from that of the others we’d interviewed. Politics tend to attract charismatic, relatable, well-spoken people. Blumenauer possessed these characteristics as well as a very rational, concise way of dealing with issues. He is a counterexample to what the media would have us believe. The media portrays the politician as a greedy, shallow shell who has nothing more than the gift of attracting attention. Blumenauer has ethics, of course, but he also implements them. He responded to our questions with statistics and scientific data, and well-founded, logical conclusions. He not only reads and listens to studies, but understands them and makes decisions based on them. He acknowledges that his way may not be the best way, but it is what he believes, and he is open to receiving new input. At the end of the interview he asked us if there was anything we didn’t agree with him on, I think partly to give us a chance to express ourselves, and partly because it is in his nature to allow for new ideas. As an added bonus, he is a bicyclist. He believes bikes to be the best form of transportation, and gave us bike pins in support of an organization trying to provide bikes to people in need all around the world. Representative Blumenauer was amazing. When he walked into the room, I knew it was going to be an amazing interview. He took his seat, sat quietly, and took a moment to look around the room at all of us, smiling at us and acknowledging us. He introduced himself and cheerfully told us how eager he was to have a meaningful conversation with us. This first impression made a huge impact on me, and I instantly knew how much this really mattered to him. You could tell from the moment he broke the silence that this man was clearly here because he wanted to be with us. He spoke precisely and passionately, and he answered our questions so honestly and thoughtfully. Blumenauer paused before every sentence he spoke and thought about what he was going to say. When he spoke, whether it was on a policy question or whether he was giving us advice, he gave careful consideration to the complex questions we asked. Representative Blumenauer was so real, engaged, and offered us his full attention. 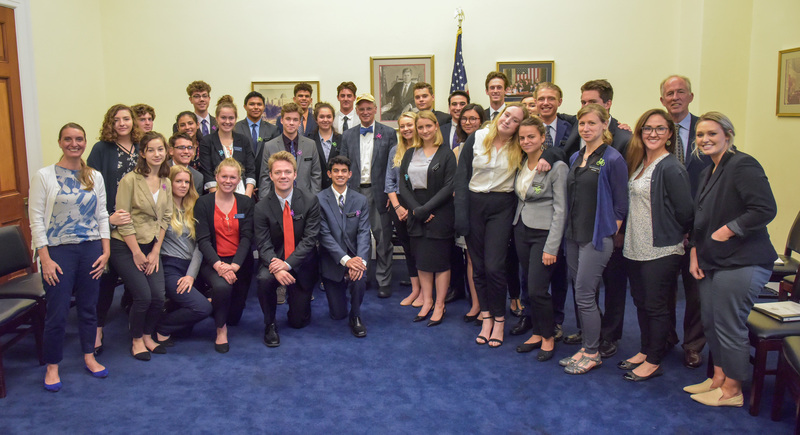 Representative Blumenauer embodies sincerity; he sincerely cares for the people and the issues he spoke with us about. Blumenauer is a representative for a district that encompasses Portland, and he stands for those people so passionately. He is selfless, his dedication is unprecedented, and he was able to answer our questions genuinely. 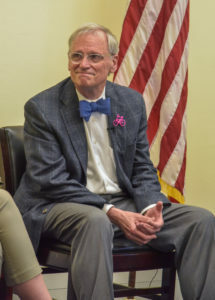 Blumenauer is a really beautiful example of what it means to be a dedicated American citizen. He gave us meaningful advice about encouraging political action, and I personally saw him as the most inspiring public figure we’ve talked with. Solid in his philosophy and so eloquently spoken, Blumenauer explained the importance of problem-solving as it pertains to political activism. The most important things I deduced from this interview are the power of selflessness and using a meaningful cause to motivate meaningful change. Yesterday we got to sit in on a debate and vote in the House chamber over the Farm Bill. Looking around the room during the debate, I could have counted the women in the room on my two hands. The majority in the room were middle to old-age white men. I couldn’t help but notice how many people were not being represented. Today we had the pleasure of interviewing Nancy Lindborg, President of the United States Institute of Peace, “an independent institution founded by Congress to provide practical solutions for preventing and resolving violent conflict around the world” (as stated in her page on the USIP website). Despite the depressing picture the media harps on, she believes peace is possible. Change can always happen because of the power of the people within a community. She had planned to become an English professor after earning two literature degrees at Stanford, but she went on a trip to Nepal and never looked back. She said she was living there like a peacemaker before her career as one had even begun. She advised we find what we are really passionate about, find our voices, and let go of the anxiety going into college. I have never met a prominent female involved in politics whose primary mission was not gender equality and women’s rights. 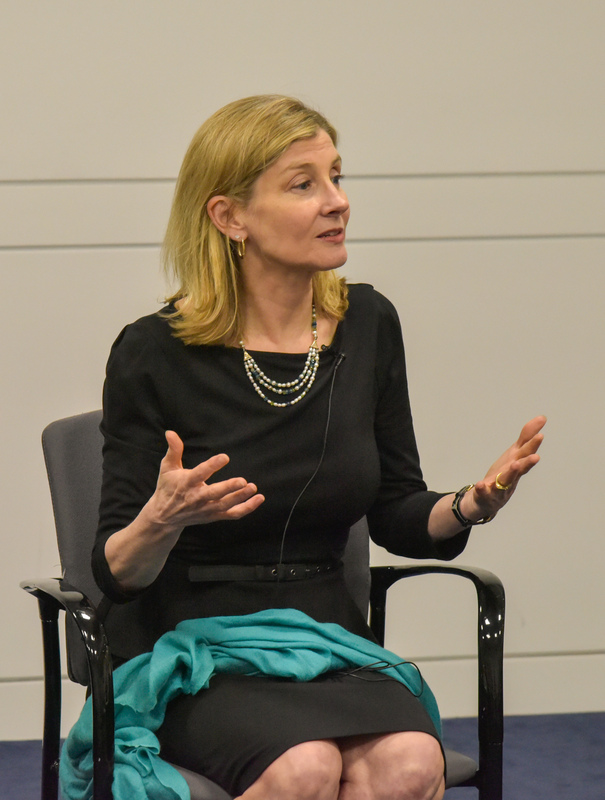 Nancy Lindborg was inspiring to me because I realized that women in politics can work on a variety of issues. She was smart, precise with her answers to our questions, and strong. I felt that we had her full attention, and she was giving us her entire self. I felt a lot of respect and awe on both sides of the interview. Lindborg was a genuinely cool person. She is a strong woman with the courage to share vulnerability. I was inspired by her position and the organization she governs. I felt represented while speaking to her. I hope one day to be able to go back to a voting session like the one that we attended in the House and feel confident that there are strong and capable leaders of diverse backgrounds and genders. Our interview with Nancy Lindborg, President of the United States Institute of Peace, was one of my favorite on this trip so far. From the moment she walked in, I was immediately intrigued by her and her alluring presence. Normally I am quite nervous to ask a question, but this time I felt completely calm to ask my question about the leadership skills she had learned from her time working with Mercy Corps. After I finished asking my question she smiled and quickly complimented my question, which instantly made me feel confident. Something I found interesting is when she said the key to being a good leader is listening. This was compelling to me because normally I think of a leader as someone who tells everyone else what to do. 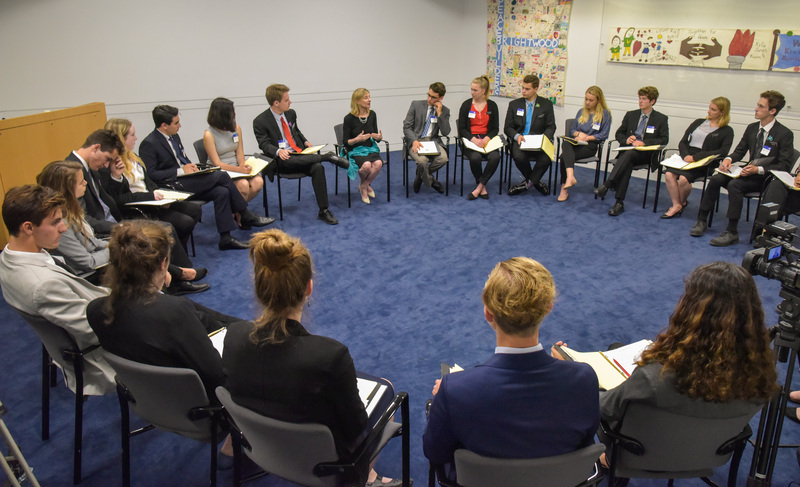 It was refreshing to hear that other people’s opinions and ideas can be a key to leadership. 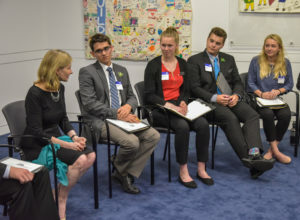 Throughout the entire interview she made the room feel very comfortable, while engaging and making comments about how prepared we were, which only made us feel like what we were doing was important and respected by the people in DC. Something else that stood out to me was when she stated that there can still be conflict even in a place of peace. Normally most people associate peace with no conflict, but that just isn’t going to happen; she said, “If there are two people together there is going to be conflict. If there is one person there will probably be conflict.” Conflict is a natural part of human nature, but the presence of conflict does not mean the absence of peace. Overall meeting Nancy Lindborg was one of the main highlights of the trip for me so far, and it was very inspiring to see a powerful woman as president of such an important organization.